Building on volumes one and two of this series, this information-packed book will deepen and broaden every artist’s exploration of this highly addictive craft. The fascinating human enterprise of creativity is emphasized throughout this engaging and readable text in historical references and the author’s personal travel accounts around the globe. Printed entirely in full color, it features over 1300 photographs and diagrams, including detailed step-by-step demonstrations by 35 different artists, with dozens of finished works to inspire the advanced and beginning lampworker alike. Designing and Rendering Natural Forms in Glass (Philosophy, Underlying Structure and Method). Detailed Human Proportion (plus Glass Eyes and Three Ways to make a Skull). Graceful Blown Shapes, including Goblet Theory (Structure, Proportion and Conceptual Development). 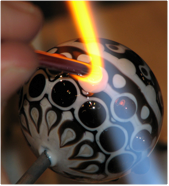 Fascinating Glass History, including American, Italian, German and Japanese Glass Traditions. Fun with Marble Runs—A Detailed Guide to Whimsical Rollercoasters for Your Marbles. Using Forms, Braces and Jigs to Make Complex Sculptures More Easily. 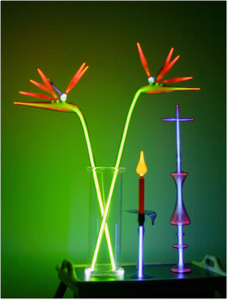 Constructing Flowers (Nine Styles, Including a Dramatic Bird of Paradise rendered in Neon). Glass Insects (Dragonfly, Mosquito, Tarantula and Beetle). Spinning Tops, Bottle Imps, Aeolipyles, Pyrophones, Radiometers, Automata and Even More Elaborate Kinetic Sculptures in Glass. Techniques for Beads and Marbles in soft glass. $59.95 retail + $14.00 S & H within the continental U.S. Wholesale inquiries welcome.